It was a little less than a year ago that I documented my email to the PA Rare Bird List about an immature Yellow-crowned Night Heron by showing photos and field sketches on my blog. Today I'm doing the same thing but this time with a Black-billed Cuckoo. I probably should have written the blog post before posting to the list but didn't think to do that. In any case here are some field sketches from today. 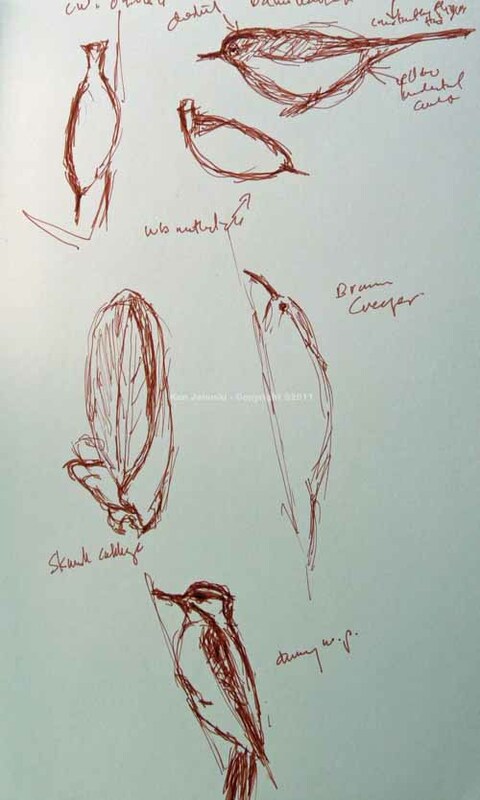 First page shows a not to hot sketch of Blue-gray Gnatcatcher taking nesting material from Tent Caterpliiars and the Black-billed Cuckoo on the left hand side. On the right a singing Yellow warbler, just the head of an Eastern Kingbird, a Solitary Sandpiper and a Song Sparrow. I was struck by the little curve at the tip of his bill. Second page shows a Northern Flicker in grass. It was hard to sketch him because he kept disappearing behind grass. Below him a Warbling Vireo. And on right another attempt at the Solitary Sandpiper. This latter technique isn't foolproof. Sometimes I just don't remember everything correctly, especially things just seen for a split second, like the Warbling Vireo looking over his shoulder, possibly preening. 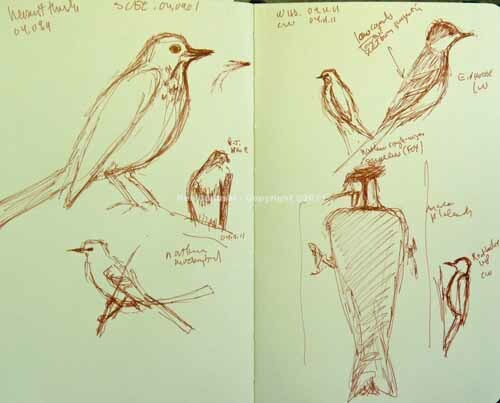 In any case that's the story on these sketches and the Black-billed Cuckoo. Things I did note on sketch that may not be legible are that the bill was black and eye red. I'm not sure I've gotten everything else correct. After posting this I decided to try a quick watercolor of the bird. 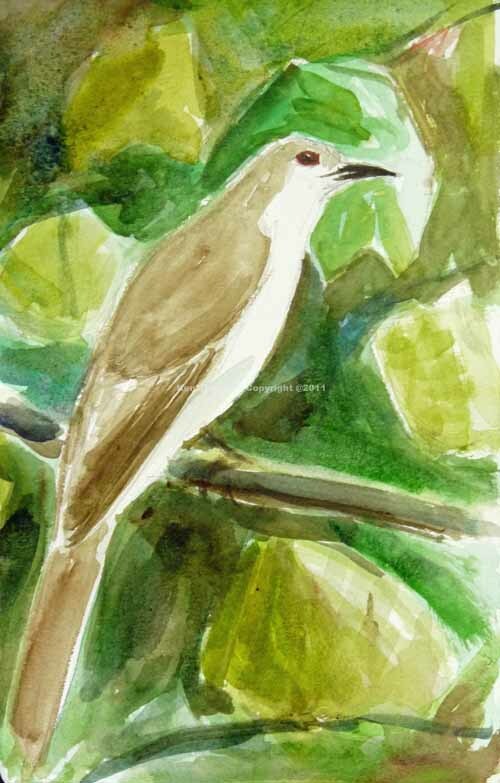 It's based on the field sketch with help from a couple of photo bird guides and my one personal photo of a Black-billed Cuckoo. One problem with painting them is that they are a bit drab: the bright red ring around black eye is the only exciting area. Otherwise just a drab, though beautiful brown on top, and a clean white/cream below. Though I showed tail spots in sketch I really couldn't see them well. The tail was more in profile so I used went back to that in painting. But it was hard to get the background of sycamore leaves, which is where he was, to work with the subtle colors of the cuckoo. I think that they overpower the bird a bit. So some other time perhaps I'll try this again. For now though it's my documentation for a first of year Black-billed Cuckoo. I hate to let the Blackburnian slip out of the top position in this blog but life, and migration, moves on. And today was the day the Wood Thrushes returned to Carpenter's Woods in Philadelphia. I went looking for warblers and other neo-tropical migrants since warm weather seems to have dumped them in huge quantities throughout Pennsylvania over the last few days. But no warblers today. That's okay though. Sometimes there are so many new birds it's hard to appreciate any of them, sort of like trying to see Rome in a day. It's hard to believe that Carpenter's Woods is ever quiet. A major road one side, renegade leaf blowers seeming to run non-stop on all other sides. Sometimes I'm surprised I can hear anything there. But there were moments today when it was quiet and all I could hear was the rich, almost orchestral song of the newly arrived Wood Thrush. The thrushes often sound like flutes, which do indeed have a rich sound. But it almost seems to be cheating Wood Thrushes to say that they just sound like one instrument. They are so rich I think it's better to liken them to an orchestra. When I lived in San Francisco many, many years ago there was always someone down near Ghirardelli Square and Fishermsn's Wharf advertised as something like a one-man band. A walking box with a person inside that spat out just about every sound you can think of. At least that's my recollection. Of course there is an avian equivalent - the Gray Catbird. Many of them have also been back for a few days, yackety-yack, yackety-yack. Still it's nice to see them back. Soon they'll be in our own backyard, scarfing down the blueberries. Some readers may remember my Wood Duck watercolor of just a month or so ago. I've not done anything that detailed since. And in the work at top I've really gone quite far afield. But I really do prefer liveliness, a sense of life, to something that looks more like a well-rendered photograph. Today along with the Wood Thrush I saw an American Robin bathing in the small stream, then raising his wings up and shaking off the water. I also saw a familiar spring sight, a Blue-gray Gnatcatcher picking apart a Tent Caterpillar 'nest' for nesting materials. I did quick sketches of all of these today. They are not great and I'm not going to show them. But the very act of trying to sketch these scenes makes it easier to do a painting based on them. I've taken the first step. The other steps are easier. 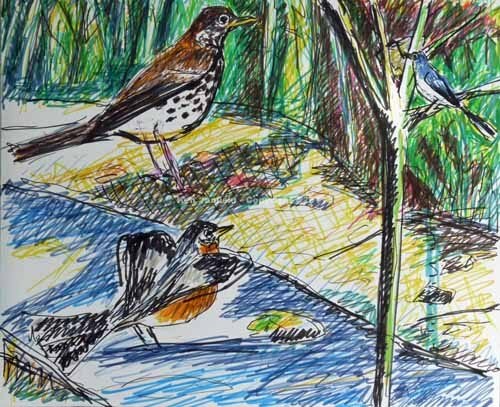 So this is a felt tip pen sketch of a composite of thrush, robin and gnatcatcher. I think it captures at least some of the excitement of being out today. I hope Eric Ennion would commend me. I think the title says it all: an Easter with a celebratory Baltimore Oriole, or American Redstart, or least likely of all a Blackburnian Warbler. I'd seen a Louisiana Waterthrush in Philadelphia on Friday. I know that they breed here, at the Wissahickon, near where I often bird. But I've rarely seen them. And I'd like to. They're one of our favorite warblers. On Friday I went a few miles further north than I normally do at the Wissahickon and sure enough I heard and saw a waterthrush. Someone I met said that they were often in that area all summer. So I thought we'd get out today before the rain came in and give Jerene a chance to see it. We did and it was a great thrill. Later we saw another one a few hundred yards away which may or may not have been the same bird. Further on we stopped to try to track down a first of year Yellow-throated Vireo, another of our favorite birds. We heard it but couldn't find it. 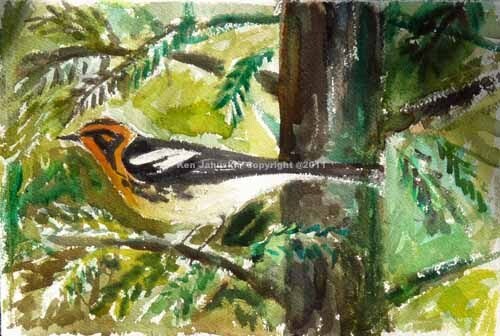 Then amidst at least 10 Yellow-rumps Jerene spotted a different bird but couldn't get the words out, much like the time a brilliant Rose-breasted Grosbeak landed in the feeder next to our kitchen window. Finally I heard Baltimore Oriole, no BLACKBURNIAN! Sure enough there was a male Blackburnian warbler in full breeding plumage not more than 15 feet away. He stuck around for at least 15 minutes. Then further down the trail we spent another 15 minutes with either him or another male Blackburnian. If you ever see one up close, and aren't color blind, you know how striking they are. That golden orange or sometimes fire engine red throat is just unbelievable. I didn't bring my camera and I'm happy I didn't. Again I was forced to look at the bird and didn't waste time trying to get photos. The field sketch I did was not very good. But it noted many of the salient aspects of this beautiful warbler. I hope I've gotten them down in this quick watercolor. Blackburnians love hemlocks. a dying species in much of the eastern US. They're a fiery jewel in the rich black and greens of hemlock needles, branches and truck. I've tried to capture that here. All of the background is from my imagination and memory. P.S. 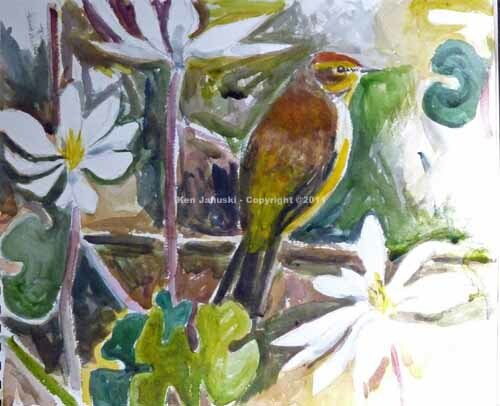 One of the very first bird paintings I did, before I was experienced to realize how little I know about birds, was the painting that serves as the header for this blog: a Blackburnian. In it I took great artistic liberties with a photo that I'd taken of a Blackburnian in Shenandoah National Park. It was/is bold, really more abstract than realistic. But it captures the boldness of a Blackburnian. Today's watercolor seems a fitting counterpoint to it. Same bird just slightly more realistic in rendering. With all the time I've spent out fieldsketching and hunting warblers and other migrants over the last two or three weeks I've had a sublimated desire to paint a warbler or two. But they're only here once a year, or twice actually if you include fall migration, and it makes most sense to get out and see them in real life. I've been doing a lot of sketches of Yellow-rumped warblers, you know the ones that you can ID just by their quick, flitty movements, only slightly less speedy and flitty than a kinglet. And I continue to learn as I do so. But they are also beautiful birds. Wouldn't it be nice to get one down in paint? Well I was out fieldsketching again today. I saw my first Louisiana Waterthrush and Yellow Warbler of the season. Yesterday I saw my first Solitary Sandpiper, Fish Crow, Green Heron, Great-crested Flycatcher and Blue-gray Gnatcatcher. And, more Yellow-rumps. I took a few photos of them as well as doing sketches. The quick watercolor at top is based on one of the photos. But it's also based on all the fieldsketching. The beauty of fieldsketching is that it forces you to see how a bird is put together. Then when you see a photo, which is always an abbreviation or distortion of the real thing, you're better prepared to use its information to paint something that's true to the bird. So as I said this is based on a photo. 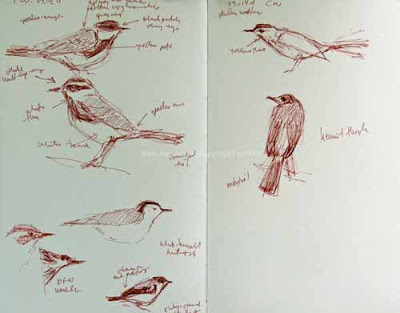 But more than that it's based on all the time I've spent looking at and sketching Yellow-rumps over the last week or two. 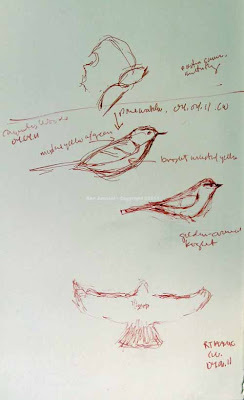 I've been wanting to do successful field sketches of wood warblers for at least three and probably more years now. 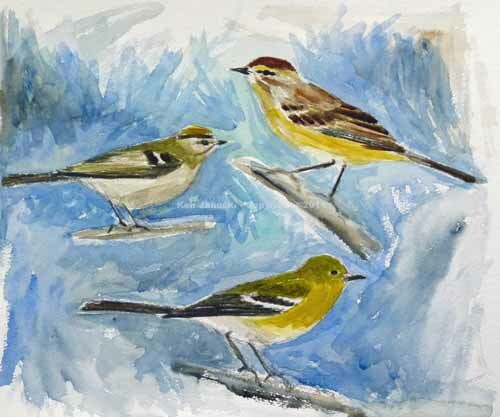 Wood warblers are my favorite birds and field sketching is my favorite type of art work, not that I'm accomplished at it. 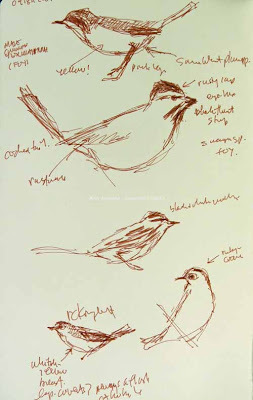 But warblers move so quickly that so far I've found it next to impossible to sketch them from life. Of course I can do it from photos but it's just not the same. I thought of that again today when I deliberately left the house without a camera. Just my binoculars and a sketchbook. And I'm happy I did. There's something frightening about trying to sketch them while they flit in front of you but also something exhilarating. I thought about my camera when I saw my first Common Yellowthroat of the season but was happy I didn't have it. With no such temptation I could try to really look at the bird and capture a mental image that I could then put down on paper. Fortunately the male Common Yellowthroat was hanging out near a very small stream at Carpenter's Woods in Philadelphia along with one Swamp Sparrow, the first I've seen this year, a few White-throated Sparrows, many Ruby-crowned Kinglets and some Blue Jays and American Robins. So if I just stood still and kept my binoculars on the spot I could continue to get glimpses of the warblers and other birds. At top is the second version of the male Common Yellowthroated Warbler. Beneath is a Swamp Sparrow, a Black-and-white Warbler, whose eye-patch I have a bit wrong, and two Ruby-crowned Kinglets. 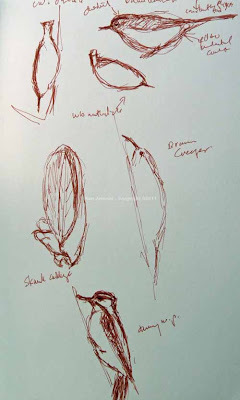 For years I wrote about how impossible it was to sketch kinglets. But I'm finally getting the hang of it. Though I have to add that I only did these two sketches when I had at least 25 and possibly 50 different views today. But they move so quickly that they're gone by the time I get my binoculars up. Still I'm starting to at least get comfortable with them, and with wood warblers. So far this year I've now sketched from life these wood warblers: Palm, Yellow-rumped, Black-and-white and Common Yellowthroat, along with numerous kinglets. The only one I saw but didn't sketch was a Pine. Hopefully I'll get another chance. These sketches are not perfect by any means. But I think if I can at least get comfortable with sketching the general shapes that then I can start paying more attention to details, like all of the various markings on the Black-and-white warbler. I got the chest streaking correct today but completely botched the wings and face. I'm sure I'll get more opportunities. 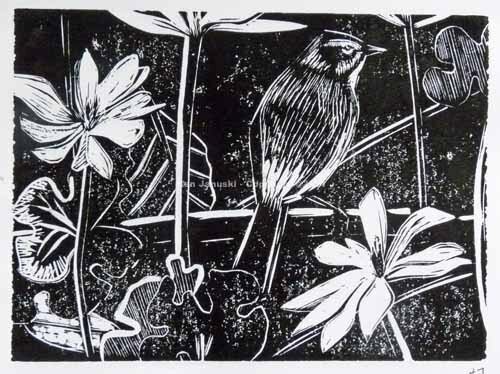 All in all though I think that this might really become the Year of Sketching Wood Warblers. I'd be thrilled if I could add at least another 10 species. That's something to look forward to. 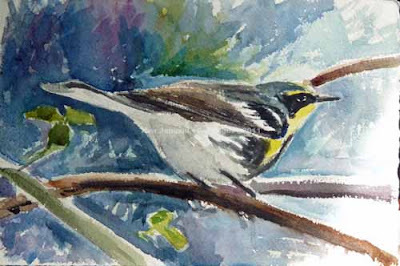 Next big question: Is it too early to consider a means of working with color in the field when sketching wood warblers? I don't want to get ahead of myself since I'm just starting to get comfortable with warbler shapes. On the other hand it seems criminal not to be able to include some sense of their striking color. Well this has been a long print, especially for one that's black and white and doesn't have the complications of reduction color prints! Perhaps it took so long because I had high expectations for it, and because I wanted to get it done in time for a competition. In any case here it is. One of the things I'm happiest with is that I was able to construct the scene from my imagination and other sources. But I never really saw this scene. I saw the Bloodroot, as well as the other leaf litter, and I saw a Palm Warbler, but never together in a scene like this. I sort of got it working in the earlier watercolor but I think it works much better and is more cohesive and believable here. I do thinks that's a virtue of pursuing the same subject in different media. You get to refine the idea. Of course if as a viewer you didn't like the idea to begin with you might have a different idea about repeating the theme. One other thing of note. Linoleum cut really lends itself to line. So it's very tempting to put outlines around objects. This can flatten them out, like cutouts, especially if the outlines are wide. But you can also use line for hatching, something that etching and engraving excel at. But this use of line tends to create a sense of volume, just the opposite of a bold outline that counteracts volume. This print has some of both. At one point I did partially remove a bold outline on one of the Bloodroot leaves at lower left. It just made the entire print look too flat. On just about every print I do it seems that I fluctuate between flatness and volume, bold, graphic line and more subtle, modeled hatching. There's rarely a clear winner. But I hope that the print survives the battle. 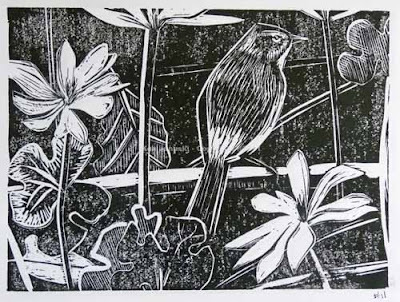 One distraction while doing this print was backyard migrants, particularly a Hermit Thrush, and migrating warblers and other birds at Carpenter's Woods. Yesterday was so nice that I had to abandon the print early in the day and do the following field sketches. 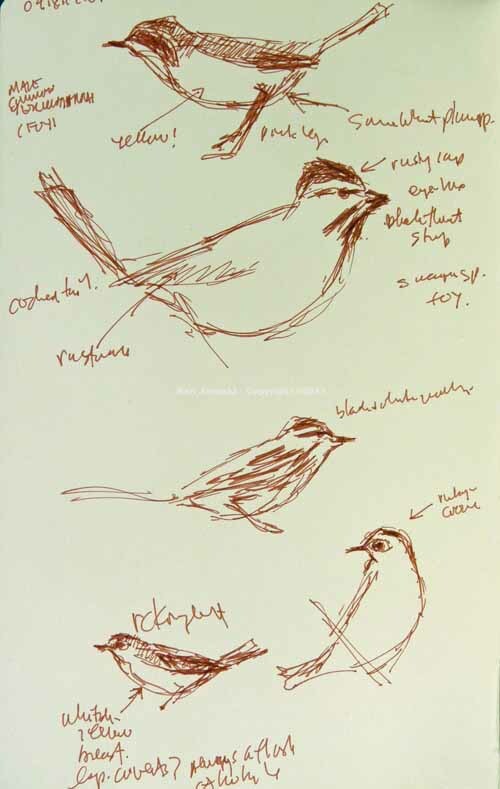 The left hand page includes two first of year Yellow-rumped Warblers at top and a first of year Black-and-white Warbler, White-breasted Nuthatch, and one of many Ruby-crowned Kinglets below. On the right hand page another Palm Warbler and another Hermit Thrush. I didn't use a scope on any of these. They were all based on just looking at the birds in my binoculars, as long as they stood still that is, and then trying to get down on paper what I'd seen. I feel like I'm definitely improving in this direction. 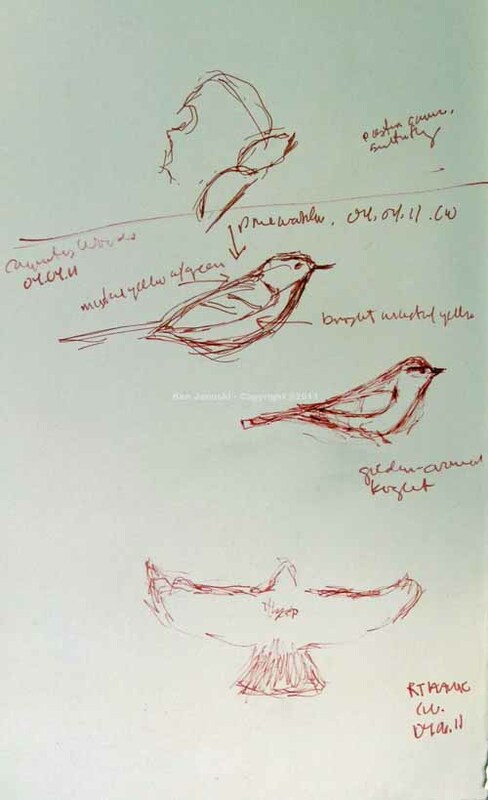 I hope this will finally be the first year when I can do some decent field sketches and perhaps even field watercolors of the neo-tropical migrants, especially my favorites the Wood Warblers. Oh yes, the print is an edition of 12. It is 6x8, or 8x11 with print borders. Gamblin oil-based ink on Rives Lightweight paper. I'm not on Facebook. I don't use Twitter. In fact I can't fathom how anyone in their right mind would. Aren't there enough distractions already? But I'm not a Luddite. I wasn't exactly an early adopter of the internet but I do remember using Gopher to sort of browse the not yet existent web. I was thrilled to get into a library at Harvard, the Fogg Museum Library I think. And I remember sitting in front of my computer in disbelief the first time I accessed a computer in another country, all before WWW was invented. I'm sure that Facebook and Twitter are old hat to some and they're on to new hot stuff. And soon it will be passe too. Technology moves at an inhuman speed. But I'd like to announce my own gift to those seeking the cutting edge (please excuse the biggest cliche of the last 100 years outside of 'pushing the envelope' or 'breaking boundaries): The World Wide Guinea Pig! One of the tenets of the open source movement in technology is that what you make doesn't have to be perfect when you make it available to the world. Many, well hopefully many, users will tell you what's wrong. Or fix it themselves. So there's constant feedback and things get better. I find a similarity between putting out software that's not yet perfect and displaying art that may not yet be quite done. I'm obviously exaggerating things when I say I've developed a new cutting edge technology. But it is something that works for me: putting a version of a new painting or print up on the web so that I can get a different view of it. As I've mentioned before it's also a false view: the light behind any images on a computer screen make the image more vibrant than any painting or print can ever be, unless it also has a light rigged up behind it and is painted on a transparent material. So I know that part of what I see will make it look better than it really is. But many if not most artists have a very hard time 'seeing' their work. I know this sounds hard to believe but it's true. I think we get so close to it that we can no longer see it. That's why artists often look at their paintings in mirrors: so they can get another perspective. I've never done that. More likely I'll leave the room and come back, hoping that that first new view will make me see my work differently. But today I have the World Wide Guinea Pig: this blog, or my web site, or the Wildlife Art thread at Birdforum. All of them allow me to see my work fresh. I also could just put the image on the computer and look at it there and never actually put it on the web. The end result is the same in that I see it in a new perspective. But the web also offers the odd chance that someone might make an interesting comment on the in-progress work. 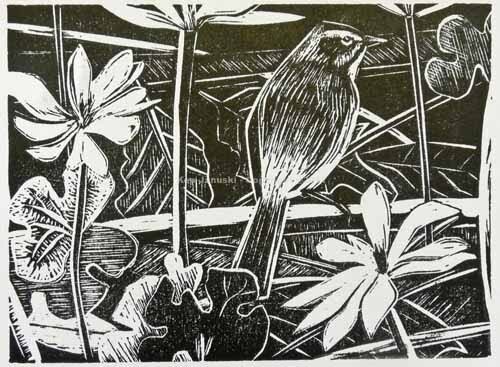 In any case all of this is just a prelude to saying that I've spent much of the day going through 10 more versions of the Palm Warbler in Bloodroot linocut. Version 17 is at top. I'm posting it because I'd like to get another view of it. And also in case anyone is interested in the progress in the lino. I think it's getting much better organized. I'm not yet sure how much I have to do. I'd like to finish it by tomorrow in order to enter it into a competition. I'm going to include a few of the earlier versions from today below. Most are in the same color ink but I did do a bit of minor experimenting along the way so you may notice some color differences. 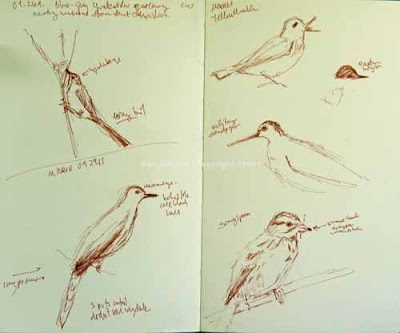 It was also such a beautiful day today that I couldn't resist searching for some migrants, and sketching them, today. I did see a couple more Palm Warblers and that reminds me that I do need to make sure that this can't be misread as a Yellow-rumped Warbler, a bird I also saw today. The eye-ring and bright rump might lead to some confusion. One more thing to think about as I finish this off. 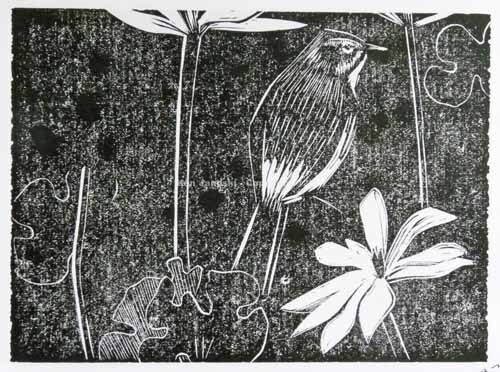 I decided to use the Palm Warbler in the Bloodroot as the subject for my next linocut and began it yesterday. It's been awhile since I've shown the progress of a linocut so I decided to take some photos of some of the versions so far. At top is version 7. Above is version five. You can see I've added a fair amount of complexity. Based on past experience I'd guess that somehow or other i'll simplify this now that I've gotten in complicated. There are three balls that I'm juggling in this print: being true to the Palm Warbler, being somewhat true to his surroundings, especially the Bloodroot, and finally making a visually exiting print. These three goals often fight with one ahother. I won't go into any detail except to say that I always need to make some compromises. And I also need to take some chances. For instance when I decided to make the bold marks of the veins of the oak leaf I realized that though it might be accurate it might also make the print too busy visually. On the other hand maybe it will both be realistic and visually exciting. That's the beauty of art and prints. You take a chance, using your artistic intuition, and hope for the best. Above is version number three, a fairly early version that shows the print starting to take shape. One thing in it is a lot of blank, black space. That is one thing that I realized early on I would need to fill. Just how I'm still not sure. Again this is part of the artistic compromise. I could just leave it blank and let the focus be on the warbler and bloodroot. But that wasn't what I saw. Both bird and wildflower blended into a complex scene. So I'd like to show some evidence of that without creating a jumbled mess. And finally a better photo of the watercolor that I also did of this same scene. The print is based on a printed copy of the watercolor. I traced it onto the linoluem block and then started improvising. I have no idea how this will work out. At this point it really needs do get organized and simplified in some way. But there is still too much flat black as well. So a combination of complicating and simplifying lies ahead. Also the curvilinear shapes fight with the straighter more geometric shapes and marks. That too needs a resolution. In case you're wondering, no, I'm not referring to myself. I don't feel abysmal and though I'm not the most social of animals I wouldn't consider myself a hermit. No the abysmal hermit the title refers to is my new attempt at a watercolor of a Hermit Thrush earlier today. I'm not going to show it. I used to show some of my failures because I thought this might be useful to others. Art is as much about failure as sucess. But this one is just so far below par that I'm leaving it. The reason I'm posting at all is that it was just two years ago on April 19, that we saw Hermit Thrushes while out birding at Fort Washington S.P. then came home to find another one in our backyard. I posted about it here. Last Friday we saw three and perhaps four at Schuylkill Center for Environmental Education. They were the first we'd seen this year. Then today we spotted another in our backyard. Given that we have a small urban backyard and each year the neighborhood loses more big trees I'm always astonished when we get any migrants. So I thought I'd celebrate with a quick watercolor of a Hermit Thrush, just like I did two years ago. I based it on a field sketch I did on Friday. That's at top, along with a Red-tailed Hawk, Northern Mockingbird, Northern Rough-winged Swallow, Eastern Phoebe, Pileated Woodpecker! !, and a Red-bellied Woodpecker. The rest of the birds were also seen during the last few days. One thing I realized in the Hermit field sketch is that the angle of the bill is always very important. It may not seem like it but I think it often is much of what gives a certain personality to a particular species. This seems especially true with thrushes. You can see that I struggled to get it right but never quite made it. So I was hoping to correct that in the watercolor. But not in this watercolor. Maybe next time. My next project will most likely be a linocut of the Palm Warbler amidst the Bloodroots, or perhaps one of the Pileated with some Trout Lilies. The Pileated is one of our favorite birds. 18 months of not seeing one was a very long dry spell. I'm glad it's over. One other note. When we saw Trout Lilies at SCEE last Friday they had just come out of the ground. There were no flowers at all and the leaves weren't more than three inches long at the most. Then yesterday I saw thousands of them along Forbidden Drive at the Wissahickon, just about three miles away from SCEE. The oddest thing is that I would guess SCEE gets more sun not less. So you'd think those wildflowers would be ahead of the ones at the Wissahickon. In another life when I have more time I'll have to explore this more. In any case it was great to see them in full bloom. Like Bloodroot they are striking in both shape and color, just crying out to be put into a painting or print. Yesterday Jerene and I spent over five hours enjoying a perfect spring day at the Schuylkill Center for Environmental Education. Sunny but cool. A perfect brisk day. Wildflowers were starting to flower: bloodroot, which we also grow in our yard, with its pure white flowers and foliage that looks like it comes from the best abstract sculptor in the world; bluebells, just starting to bloom; wake-robin; and trout lilies just starting to show their beautiful speckled(like a trout) straplike leaves. We saw at least three Hermit Thrush, our first of the year, as well as our first Eastern Towhees. We saw just one warbler, a Palm Warbler. Unlike most warblers he just sat there. I knew he wouldn't do this though so I didn't get out my sketchbook and try to sketch him. I'd learned my lesson on that score at Carpenter's Woods on Friday. So what does he do? Just sit there for five or ten minutes. So I took quite a few photos. Palm Warblers are generally the first warblers I see each year, even though Pines often arrive earlier. I just don't see too many of them though. But Palms are a little more common, often walking through another wildflower that looks like it might have been designed by an abstract sculptor, the Mayapple. It doesn't reach the abstract heights of bloodroot but it's still very attractive. 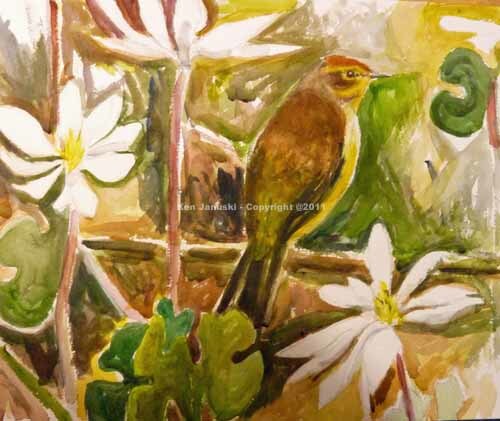 For years I've thought about combining a Palm Warbler and some Mayapples in a painting. But seeing all the Bloodroot yesterday made me want to try something that might even make a stronger painting: Palm Warbler and Bloodroot. I never saw such a scene. But it's not all that unlikely. Given all of the good photos I took yesterday there was a great temptation to just paint a more realistic version of a Palm based on a photo. But I really want to pursue using my field sketches as well as making up composite scenes, not being limited by what photos give me. So that's what I did here. It started well, then fell apart. I was about to toss it; or just give up on it when I decided to try just a bit more work. Mainly I added darks to try to tie the whole thing together. I think it's somewhat successful. In any case it's successful enough to convince me to continue in this direction. I'd like to show greater imagination in my art. 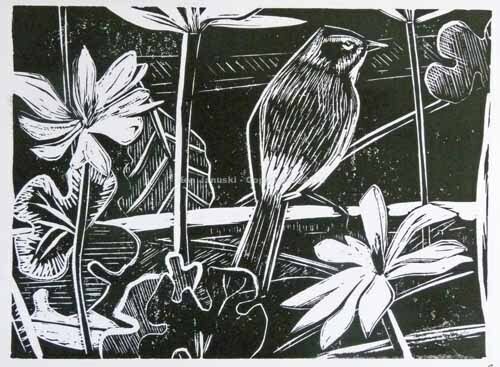 Each year my belief in working from life is put to the test with Wood Warblers and Kinglets. I'm almost reduced to tears, at least to the state of rank beginner, when I try to sketch or paint them from life. And yet I do plod on. The main reason for this is that they're such beautiful birds. It's always a pleasure to see them, especially the warblers. But the temptation is always to just grab for the camera and forget about the futile attempt to sketch them. I confess I often do just this. But it always bothers me. And when I see the work of artists who do work from life and manage to capture wood warblers I know why I pursue this. Their works seem worthy of the birds. They capture their beauty as well as their vitality and the actual experience of seeing them. I've done many drawings and watercolors of warblers based on photos I've taken. I like them. But they don't compare to how much I like the work of artists who work from life and capture warblers. I was reminded of this while rereading Darren Woodhead's 'Up River' the last few days. All of his work is in the field. And it shows. It just overflows with brightness and life. 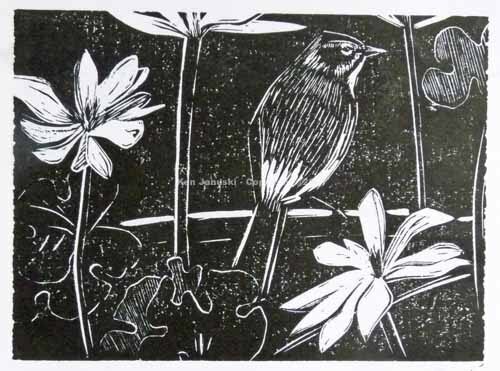 Since he's in the UK there are no wood warblers but there are similar birds there, as well as butterflies, another subject that looks best when done from life. We had some high 70s weather here on Monday so I thought it might be worthwhile to go out and check for some migrants coming in with the warm weather. Sure enough: my first Pine and Palm Warblers of the year. As well as Golden-crowned Kinglets. They're all portrayed in the watercolor at top. 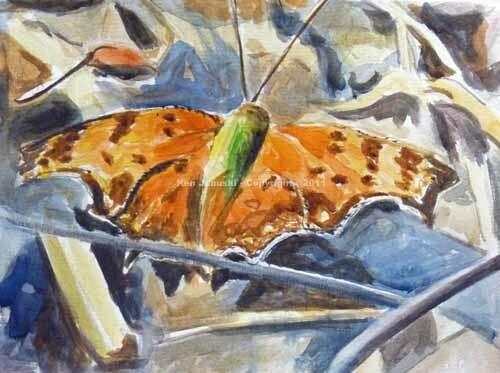 This watercolor is based primarily on my field sketches, which are also at top. 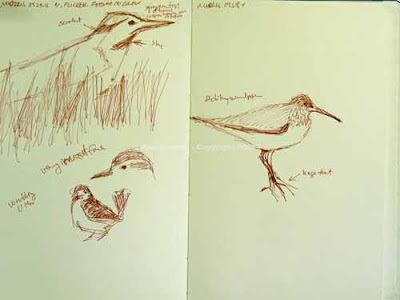 I also used my photos but only to check some detail that the field sketches missed. As you can see it leaves something to be desired. But I forced myself to work this way and will continue to do so. The work I admire most does not primarily rely on photos. There is an exuberance to it that I think happens precisely because it does not rely on photos. Other birds seen the last few days have included Brown Creepers, Hairy Woodpeckers, Eastern Phoebes, Northern Flickers, etc. Still waiting to see an Osprey overhead, or maybe a Bald Eagle like last year, and of course one of my favorites, the Blue-Headed Vireo. Speaking of which it's hard to believe but soon the main song in the woods will be the Red-eyed Vireo. Spring and then summer are on their way. I was tempted to title this 'Painting More FOYs' but realized that not everyone recognizes the FOY acronym. It stands for first of year, and usually refers to the first example of a particular bird species seen each year. So each spring birds like Eastern Phoebes are FOYs in March, at least in Philadelphia where I live. But I don't want to get lost in birding lingo. So I chose the current title. 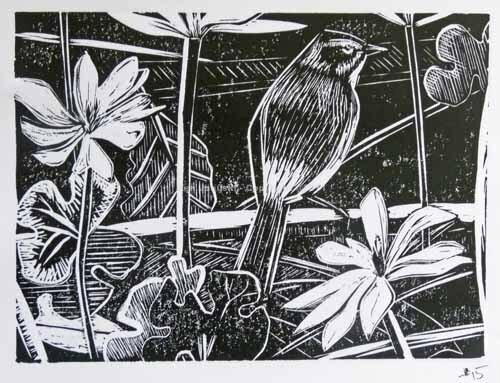 My first reaction when I think of 'painting spring' is a landscape in light greens, yellows, maybe pinks. Or at least some foliage or flowers in those colors. Spring is often first seen in the changing of dull gray and brown vegetation to brighter colors. What about the brilliant orange of the Eastern Comma seen above though? Isn't it an example of spring? Yes it is along with other butterflies, moths, insects, birds, frogs, etc. For me it's these members of the animal kingdom that are even more indicative of spring. The Eastern Comma, which I always confuse with the Question Mark, first appeared a week or two ago at Morris Arboretum. Yesterday we saw another one, along with our first cabbage moth of the year. So this is probably my first attempt at a butterfly in watercolor. I also did a live field sketch yesterday, but like a bird the butterfly flew off after I'd barely gotten started. We also saw about 10 Tree Swallows yesterday. It was hard to get an accurate count because they swoop by so quickly and travel large distances on each exuberant swoop. We never really saw more than 6 in front of us at one time. But seconds later we'd see a few more quite a distance away. We're they the same or different. My best guess is that at least some were different. So I came up with 10 as my best guess count. Tree Swallows are also some of the first birds to arrive each spring. This painting is based on a photo that I took a week or two ago, also at Morris. 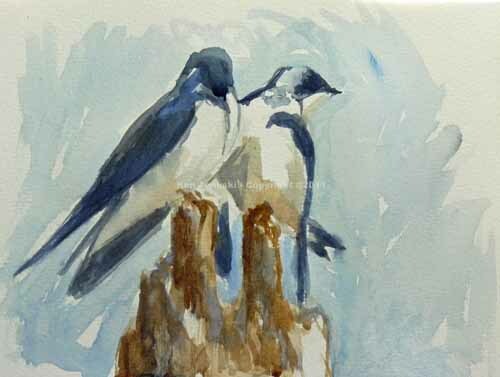 But unlike the watercolor of the Eastern Comma, where I tried to be meticulous and spent hours on, these Tree Swallows were done in 15 minutes. A flash painting. I've posted this type of painting numerous times in the past. I guess it's a bit like a 'gesture drawing', where you have less than a minute to draw something, generally a human model, in a pose. The virtue of this type of drawing or painting is that you have to simplify, almost have to feel and empathize with what you see, rather than think about it. I love these types of drawings and paintings. They're almost always lively. They have a sense of life, unlike more detailed paintngs, which can get many of the details that you might find in a photo, but lack any sense of life. In any case I've been at a bit of a loss as to my next subject for a print or painting. Flash paintings always help to get me over the hump and onto something new. And when you're doing them you feel a bit like a swallow in full swoop, confident that you won't belly-flop into the water.